With a simple idea, and without giving up, you can make an impact. BetterWorldians Radio today announced that Dale Beatty, co-founder of Purple Heart Homes, was a guest on the weekly Internet radio show. BetterWorldians Radio inspires with the people and ideas that are making the world a better place. The show featuring Beatty aired on Thursday, May 22nd and is now available via podcast on the VoiceAmerica Variety Channel (http://BetterWorldiansRadio.com). 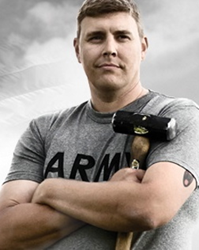 Beatty discussed his journey from a life-altering injury while serving in Iraq, to co-founding Purple Heart Homes. He explained how his organization’s mission to help disabled Veterans live happier lives in homes customized to their needs brings together Veterans from all eras. Beatty said he hopes Purple Heart Homes will inspire everyone to realize that they, too, can make a difference. “With a simple idea, and without giving up, you can make an impact,” said Beatty. In 2004, Staff Sergeant Dale Beatty deployed with the North Carolina National Guard to Iraq in support of Operation Iraqi Freedom. In 2004 while on a patrol route that was littered with highly active insurgent operations, the vehicle Beatty was riding in was ripped apart by anti-tank mines. The explosion was so severe that it left Beatty a double amputee below the knees. Thanks to support from the Iredell Homes Builders Association and many members from the local community in and around Statesville, NC, a specially adapted barrier free home was built for Beatty and his family, with Beatty serving as general contractor. As a result of all the support from his community – Dale Beatty and his battle buddy John Gallina wanted to help other Service Connected Disabled Veterans with their housing solutions. Together they co-founded Purple Heart Homes with money from their disability checks to help Veterans and their caregivers from all eras. Learn more at http://PurpleHeartHomesUSA.org.